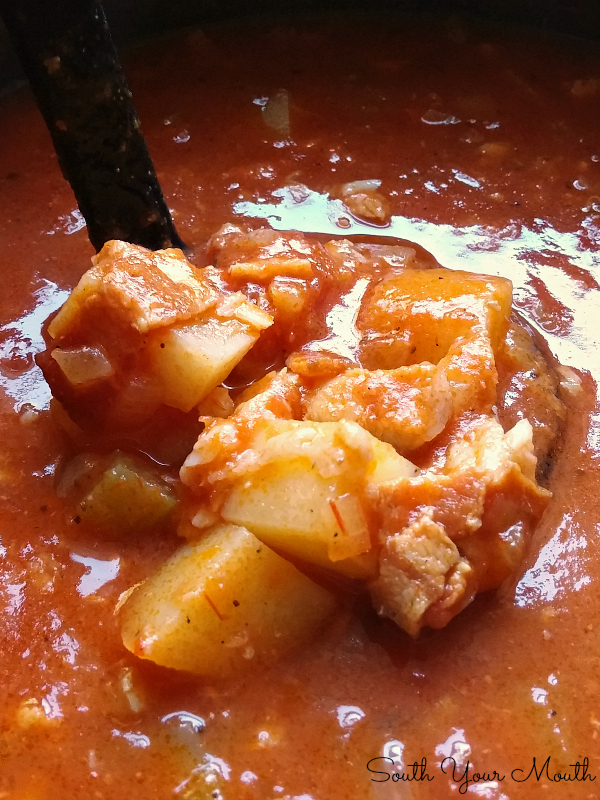 Classic Southern catfish stew recipe with potatoes, stewed tomatoes and fatback or bacon. The last time I was in Texas I ate my weight in fried catfish (because Lord, them Texans do know how to fry up a catfish!). There are literally restaurants that specialize in it because catfish are so prevalent (and HUGE!) in Texas so I asked around about Catfish Stew and no one that I talked to had ever heard of it! I was like... ummm... it's like the state stew of South Carolina (or it should be anyway!) but nope, nobody knew what I was talking about so, maybe Catfish Stew is a regional thing in the South. Like boiled peanuts and macaroni & cheese made with eggs! Mama and Daddy go fishing. A lot. Their freezer is always stocked with local freshwater goodness like bream, crappy, rock fish (striped bass) and catfish. Yay for me because Husband doesn't much care for any of it (eating it or fishing for it) so I can always get my fix at their house. Daddy called me one day asking if I had a recipe for catfish stew because he'd never tried to make it from an actual recipe (we like to just throw stuff in a pot, love on it, and hope for the best!). I’d never made it before but had saved this recipe once upon a time thinking it looked like a solid place to start so I sent it to him. They whipped up a pot of it and brought it over and, oh my sweet Lord, was it ever good! Mama also brought over a pan of her Skillet Cornbread and the two went so good together! I was one happy gal! 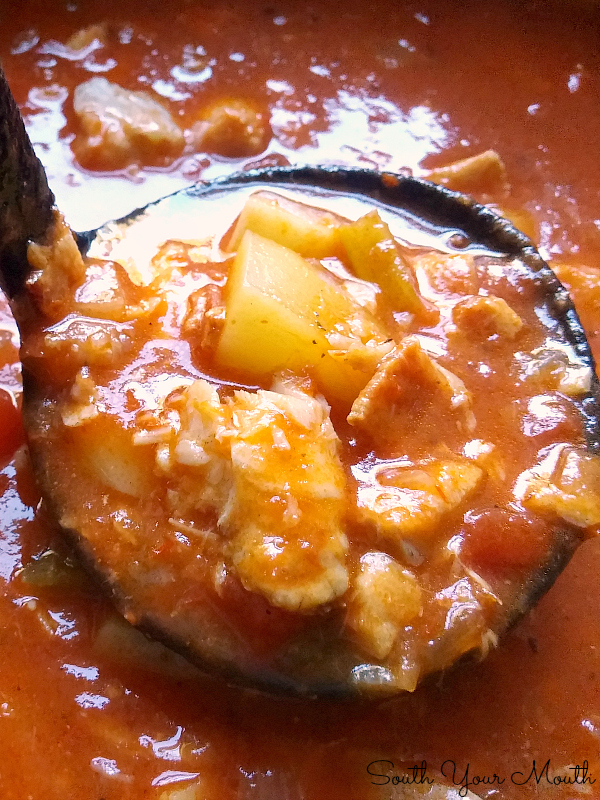 I've made some changes over the years, but this is my recipe for Catfish Stew! Brown bacon or fatback in a Dutch oven or soup pot over medium-high heat until crisp. Add onions and celery then sauté until onions are tender (3-5 minutes). Add tomatoes, fish stock, ketchup, worcestershire, seasonings and potatoes then stir well. Add water to the pot until potatoes are submerged. Bring pot to a boil then reduce heat to medium-low, cover and cook for 20-30 minutes or until potatoes are very tender. Add catfish, cover then continue cooking for 10 minutes. Taste for seasoning then add salt and pepper if desired. Remove from heat, cover then allow stew to rest for 15-20 minutes before serving. Add tomatoes, ketchup, worcestershire, seasonings and potatoes then stir well. Add water to the pot until potatoes are submerged. Bring pot to a boil then reduce heat to medium-low, cover and cook for 20-30 minutes or until potatoes are very tender. Add whole, dressed catfish, cover then continue cooking for 15 minutes or until catfish is cooked through. Remove catfish from the pot then remove the cooked fish from the bones and skin. Discard bones and skin. Taste for seasoning then add salt and pepper if desired. Add cooked catfish back to the stew then gently stir. Remove from heat, cover then allow stew to rest for 15-20 minutes before serving. Use canned or fish stock if available. If unavailable, you can use water or make your own. Your fish monger will be DELIGHTED to give you a sack of bones or shrimp shells that you can use to make a stock by simmering with water. Mandy - even better - instead of the vegetable oil in your cast iron skillet, melt butter in it, swirl it around so it's foamy and just starting to turn brown - and then put your batter in. Oh my! The butter makes the outside buttery and crispy and oh so yummy. I have an old skillet sizzled cornbread recipe from an old Crescent Dragonwagon cookbook, and the ingredients are mostly the same (love the buttermilk tanginess) - but her final step with the butter takes it right over the cliff of awesomeness! Real Southern cornbread contains NO SUGAR! Well, I suppose that depends on who you ask. I, for one, think a little bit is divine. 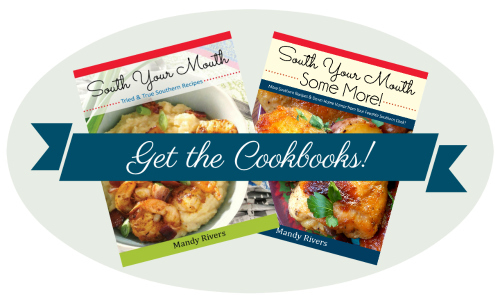 And I think I might know a thing or two about Southern cooking. And, um, why are you YELLING?! You weren't kidding about the best cornbread ever! I used your recipe for my crawfish cornbread dressing this year, and it was amazing! Not all of the cornbread made it into the dressing, and I've been told I need to make it again...soon. Thank you for sharing your delicious recipes! I don't have any catfish on hand, do you think tilapia could work as a substitute? Not sure if it would just fall apart while cooking. I think it will work! It probably will fall apart a bit but that's OK! 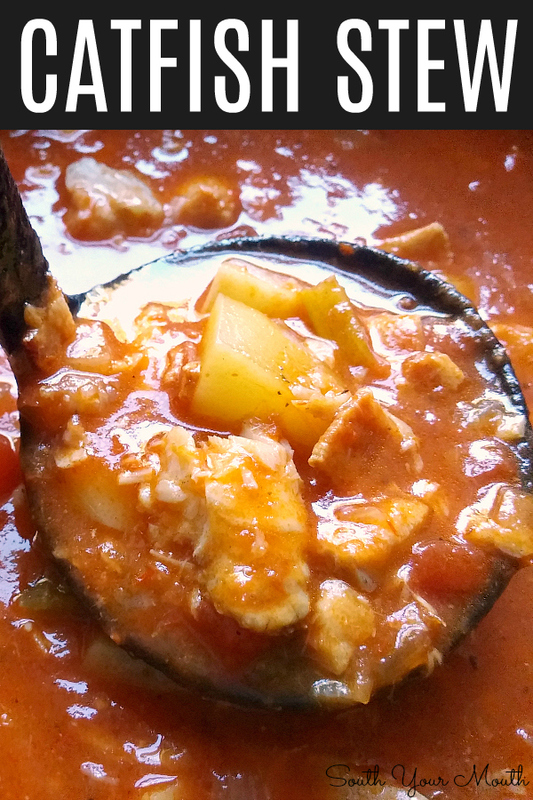 Have you ever tried a catfish stew made with tomato juice? I have tasted it and it is good but cant find a recipe. I am going to try yours but may add some sugar to it. Recipe for catfish stew. 1 large can tomato juice large onion and catfish. Saute onion in a little olive oil then add tomatoe juice and bring to a boil. Add bite size chunks of catfish cover and cook on low for about 10 minutes. Serve over white rice. You can also switch out the catfish with 3 cans of salmon bones and all. The salmon stew is better if it sits in the refrigerator overnight. Serve over white rice or cornbread. Salt and pepper both to taste. Salmon stew freezes very well. You will love these recipes! This might be a stupid question, but is the catfish cooked when you add it in?